Snoring in children: Cute or bad? Obstructive sleep apnea or more commonly known by its acronym “OSA” is a condition wherein there is repeated choking occurring several times during sleep. This often presents with snoring and the bed partner complains of hearing repeated choking or gasping during sleep. These disturbing events could happen as much as hundreds of times per night and generally, affected people do not have any recollection of these occurrences. As a result, they would wake up unrefreshed and fatigued, sometimes even accompanied by morning headaches and unexplained excessive daytime sleepiness which affects their work and safety. Although the awareness for adult obstructive sleep apnea had been gaining attention in recent years, not many are aware that obstructive sleep apnea could also occur in children. Unlike adults who often complain of excessive daytime sleepiness and fatigue, children who suffer from OSA exhibit behavioral and learning difficulties. Parents would often report aggressive behavior, poor school performance, attention deficiency, hyperactivity and moodiness. Some are even misclassified as having attention deficit hyperactive disorder (ADHD) because of the overlap in their presentation. During sleep, these children are restless, sweat a lot, bed wet, hyperextend their necks and mouth to breathe. Common causes of OSA in children are due to large tonsils and adenoids, craniofacial abnormalities, neuromuscular weakness and weight gain. Most physicians would equate large tonsils as the primary cause of OSA, however, even children with small tonsils can have OSA. The reverse is also true. Not all children who have large tonsils will have sleep apnea. Despite a good review of the symptoms and thorough physical examination, there are many children that are under-diagnosed or over-diagnosed, which leads to continued problems in development or unnecessary risks like surgery, respectively. An overnight-attended polysomnography or sleep study remains to be the gold standard in diagnosing OSA in children, no matter how young they are. The study involves spending one night in a special room designed to mimic a regular bedroom. Several sensors are placed throughout the body to monitor essential processes like sleep quality, snoring sound, breathing through the nose and mouth, teeth grinding, heart rate, chest movement, abdominal movement, oxygen saturation, carbon dioxide retention, limb movement, and sleeping position. All the data collected are tediously analyzed manually and are interpreted by a sleep specialist. It is very important that the test device and the analysis of these sleep studies follow the latest guidelines set by the American Academy of Sleep Medicine (AASM). The repeated interruption of sleep and decrease in oxygen in these children lead to repeated stress to body of these young individuals. It is not surprising to see OSA children to develop pulmonary hypertension, heart enlargement, growth retardation and diabetes. Although OSA may not directly cause these medical conditions, there are a growing number of evidences that the presence of OSA contributes to the development of these conditions. Perhaps the most frequently encountered complications of OSA in children are behavioral abnormalities and amongst them is hyperactivity. Most children with OSA will somewhat exhibit some form of hyperactivity which is more pronounced in those who have more severe disease. Attention deficiency in these children is also present but not as common as hyperactivity, and it directly affects their learning and memory. Parents will notice a sudden drop in the performance of their child who otherwise excelled in the previous semester or school year. Usually, the development of both hyperactivity and inattentiveness coincides with the time their child started to snore. Since symptoms of ADHD overlap with that of OSA, a sleep study is beneficial in establishing whether to treat the snoring or not before starting treatment for ADHD. There are several evidences that some patients that were diagnosed to have ADHD with OSA subsequently improved after receiving treatment for their sleep apnea. Thus, asking for snoring and doing a sleep study might be a worthwhile consideration in children suspected to have ADHD. Adenotonsillectomy (AT) is still the first line treatment for OSA in children. This would involve the surgical removal of the tonsils and adenoids under general anesthesia. Complications include bleeding, upper airway obstruction due to airway edema, pulmonary edema and respiratory failure. These complications seldom happen with proper preparation (i.e. sleep study and pre-operative clearances) and with proper equipment for monitoring. Even though AT would result in improvement of sleep quality, daytime behavior and learning, around 30-40% of these children will still have residual disease, which is why a repeat sleep study is necessary after the surgery to monitor the outcome. Other treatments for pediatric sleep apnea include positive airway pressure devices, dental procedures/appliances and weight management. Early intervention is the key to successful management of OSA in children. For more information, contact the Comprehensive Sleep Disorders Center of St. Luke’s Medical Center-Global City at (632) 7897700 ext. 2009 or St. Luke’s Medical Center-Quezon City at (632) 7230101/0301 ext. 5559. Dr. Keith Aguilera is the Head of the Comprehensive Sleep Disorders Center in St. Luke’s Medical Center – Global City. He is also the Program Director of the Sleep Medicine Fellowship Program of St. Luke’s Medical Center and an Assistant Professor I at the St. Luke’s College of Medicine-William H. Quasha Memorial. 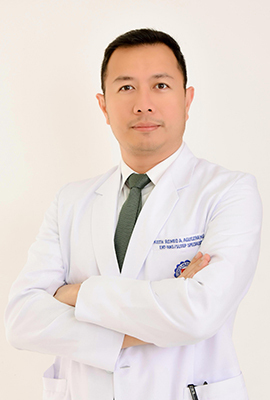 Currently, he is the Treasurer of the Philippine Society of Sleep Medicine and holds the Chair position in the Philippine Board of Sleep Medicine.